Pulp Summer Slam 13 is coming, one of our favorite rock concert event that showcase local and invited foreign rock bands together in one stage. 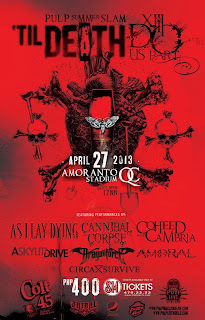 Pulp Summer Slam 13 theme for this year’s event is ‘Til Death Do Us Part’ that features our favorite death metal bands music and other rock bands. 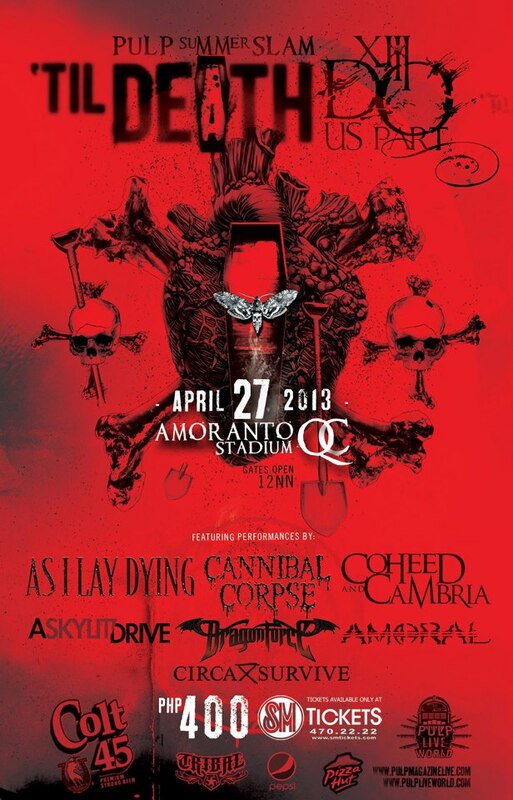 Pulp Summer Slam 13 (XII) will happen at the Amoranto Stadium, Quezon City on Saturday, April 27, 2013. You may continue reading below for Pulp Summer Slam 2013 ticket price and band line-ups. How much is the ticket for Pulp Summer Slam 13? Ticket is only 400 pesos. What time the gate will open for Pulp Summer Slam XIII? Gate will open at 12 noon. Show starts 1PM. Where can I buy Pulp Summer Slam 13 ticket? Tickets are available at SM Tickets , or you may call 470-22-22. Pulp Summer Slam 13 is brought to us by Pulp Live World.